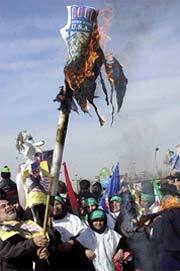 EVERY year, the anniversary of Iran's Islamic revolution is an occasion for an outpouring of hostility towards America. But this time the feelings are running particularly high, because of the reaction in Iran to President George Bush's state-of-the-union speech last month, in which he characterised Iran, along with Iraq and North Korea, as part of an axis of evil. The immediate impact of the speech inside Iran seems to have been to unite opinion from across the political spectrum behind a public position of fierce anti-Americanism. Inevitably, for example, Iran's refusal last week to accept Britain's new ambassador, David Reddaway, was interpreted in this context. Attacks on Mr Reddaway in conservative Iranian newspapers for being Jewish (he is not) and a spy (Britain says he is not) seemed a pretext. Rather, this looked like a victory for hardliners determined to wreck reformists' efforts to build bridges with Britain and other western countries. Britain, after all, makes much of the closeness of its alliance with America, and, through sending its foreign secretary, Jack Straw, to Tehran after the September 11th attacks on America, seemed to be positioning itself as an intermediary. The rhetorical response to the axis of evil speech was predictable enough: a mix of righteousness, dismay and reflexive abuse. One observation, however, stood out. A spokesman for the government, which under the president, Muhammad Khatami, wants reform, presented Mr Bushs remarks as evidence that, despite the governments clear stance, an interfering minority is taking foreign-policy decisions. Rather than repudiate Mr Bushs allegations that Iran is engaged in pursuing weapons of mass destruction, exporting terror, and repressing its citizens, the spokesman simply demanded proof for all this. Although they fight on domestic issues, Irans conservative establishment and the reformists gathered round Mr Khatami have until now spoken with roughly one voice on foreign policy. Presenting a united front to the world was a way of defending a common good: the honour and continuity of the 1979 Islamic revolution. Even now, Iranians of all stripes reckon that Mr Bush has been influenced by Israels anti-Iran propaganda. If there is now a new discordancy, it suggests that some Iranians no longer consider that common good to be good. Irans domestic power struggle, a saga of tedious obstructionism that began when the reformists captured parliament two years ago, is gradually starting to erode revolutionary principles. Under constant attack from the conservatives, parliament is planning to stage a referendum on what people think of the authority of the countrys all-powerful, but unelected, institutions. Even if such a bill is vetoed by one of those institutions, Iran would still have a new battleline between todays theocracy and what is beginning to look more like a liberal democracy. Mehdi Karrubi, the parliamentary speaker, exemplifies the new spirit of confrontation. Not long ago, the speakers timidly reformist proclivities, clerics gown and good links with the conservatives made him the ideal person to broker deals between the two camps. No longer: he is now prepared to go on the offensive on the reformists behalf. Yet his ideology remains opaque. He himself is always respectful towards Irans supreme leader, Ayatollah Ali Khamenei, though some of the deputies he protects want the ayatollahs powers curtailed. And on the revolutionary anniversary, he said that even opponents of the Islamic regime should demonstrate because of the baseless, erroneous and insulting comments against Iran. Many reformists blame ill-intentioned hardliners for upsetting Mr Bush. 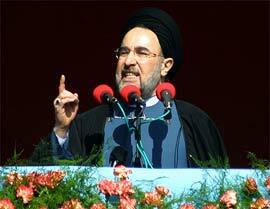 Since Mr Khatami came to power five years ago, he has tried to improve Irans relations with the rest of the world. America remained the exception. But when Mr Bush began his war on Afghanistan, reformists saw a chance not only to end the huge social and financial costs of receiving Afghan refugees and opium, but also to build trust with the US. Just about everyone, except for the American administration, seems to agree that Irans post-September role in Afghanistan has been mostly constructive. Having helped the Northern Alliance to military victory, Iran had a hand in persuading its leader, Burhanuddin Rabbani, to abandon his hopes of running the country. When Ismail Khan, the self-appointed governor in Herat, threatened to boycott Hamid Karzais inauguration, Irans ambassador cajoled him into attendance. The same envoy is now trying to get Mr Karzais cabinet to ratify Mr Khans position. Iran is also prepared to help with nation-building. Our work to stabilise Afghanistan, says an official, has only just begun. Even after Mr Bush's provocative speech, Iran has decided to close down the offices maintained on its soil by Gulbuddin Hekmatyar, a leading Afghan warlord. Despite such gestures of support for the new interim administration in Kabul, Mr Bush prefers to concentrate on reports that Iran has helped al-Qaeda men to safety. On February 13th, the Iranian press reported that a member of Iran's parliamentary national-security commission had said that a number of al-Qaeda members had illegally entered Iran and had been arrested. The same day, in what seemed another effort to counter American criticism, an anonymous senior politician was quoted in the Financial Times, as saying that Iran was preparing to hand back 25 Taliban and al-Qaeda prisoners to their own countries. If some Iranians have indeed been helping fugitives escape from Afghanistan, the spoilers are no friends of Mr Khatamiand their mischief is small beer next to Irans positive contribution. It is possible that the same mischief-makers, or people who think like them, had a hand in the sea-borne cache of arms, apparently bound for Palestine, that Israel seized last month. They will also have applauded a recent speech by Ali Akbar Hashemi Rafsanjani, in which the former president suggested that Israel could easily be annihilated by Muslim countries with nuclear weapons. It all makes great propaganda for Irans enemies, in America and Israel, whose expressions of outrage give local hardliners a pretext to bash Mr Khatamis policies of detente. Small wonder that a swirl of conspiracy theories has been used to explain these embarrassments. Do Israel and Iranian hardliners share an interest in preventing an improvement of Iranian-American relations? Answer: Yes. Irans behaviour abroad, while by no means exemplary, has got better since Mr Khatami came to power. Even if, as the US believes, Iran plans to develop weapons of mass destruction, Mr Khatamis influence means they are unlikely to be usedfar less likely, for instance, than Indias and Pakistans nuclear weapons. The country continues in a state of protracted crisis. Rather than quietly encourage the hobbled president, Mr Bush has made things harder for him. Yet Mr Khatami, besides enjoying the support of the vast majority of his people, understands, and agrees with, those non-negotiable demands of human dignity that Mr Bush adumbrated during his state-of-the-union address: the rule of law, limits on the power of the state, respect for women, private property, free speech, equal justice, and religious tolerance.